Our company is considered a renowned manufacturer and supplier of Name Badges for Hospitality Sector. 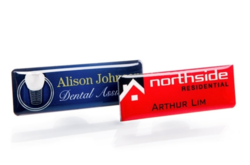 Obtainable in multiple colors, shapes, sizes and designs, these lightweight name badges are ideal for representing staff name, designation, hospital name and other related information, efficiently. Acclaimed for its supreme finishing and durability, the proffered compilation is widely asked for. Paragon Printers is a trustworthy manufacturer and supplier in the business to proffer Magnetic Name Badges. Available in customized specifications, these badges are suitable for employee’s name, company’s name, logo or any kind of information. Strong and durable, the proffered name badges are capable of holding safely, even through several layers of clothing. 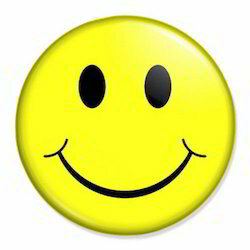 We are manufacturer of Smiley Badges. We provide high-quality products to our clients.